Munich has an unbelievable 24 Christmas Markets! 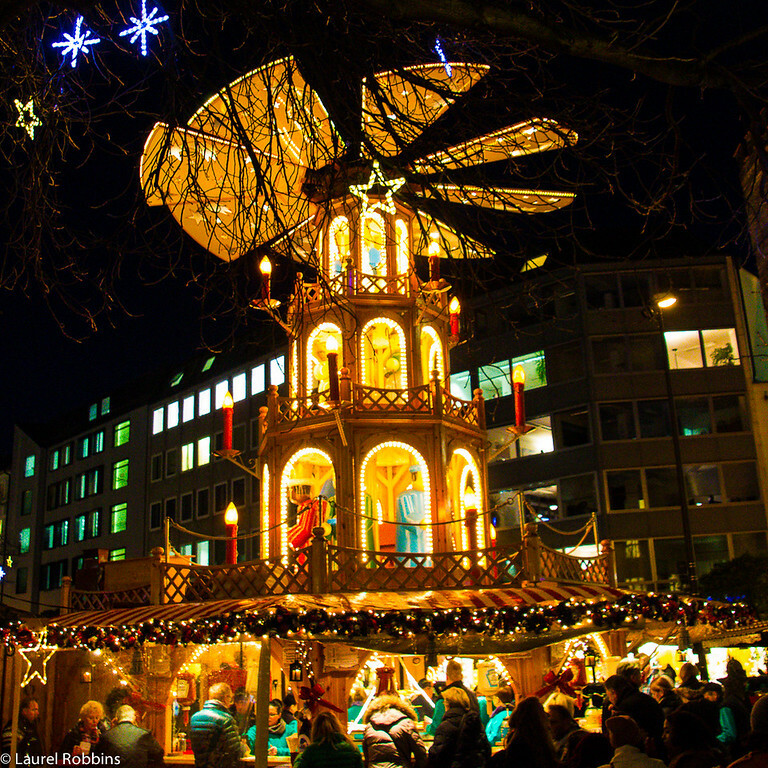 It’s one of the best cities in Germany to celebrate the holiday season. Upon entering the Medieval Market in Wittelsbacher Platz (near Odeonsplatz) you’ll wonder if you’ve just stepped into a time machine and popped out back in the middle ages. It’s hard to compete with a Christmas market held in the courtyard of a palace. You’ll also find a fairytale village which is always a hit with children. Expect singing moose and miniature Santa Clauses singing Christmas carols. I find it impossible to identify just one reason why I love Tollwood Winter Festival so much. Tollwood is a combined Christmas market/exhibition of cultural, political and scientific events. My favourite place in the entire Munich Christmas Market is at Sternenplatzl (Star Platz) at the Rindermarkt. The other unique aspect of the Munich Christmas Market is the Kripperlmarkt (Manger Market). It’s toted as being “probably” the largest manger market in Germany. What are your favourite Christmas markets in Munich? Christmas Markets all share commonalities. There are vendors selling their wares, and locals meeting over a mug of Glühwein, but each has its own flair. Before you go, be sure to read my Tips for Making the Most of Your Time at a Christmas Market. Vendors dressed in medieval clothing sell their medieval wares. Glühwein is served in heavy hand-pottered mugs. On weekends, there are a variety of free musical performances played on long-forgotten instruments dating back to the middle ages. Children especially enjoy this market. Christmas Market in the courtyard of the Munich Residenz. Strategically placed lights provide the WOW factor at the entrance. 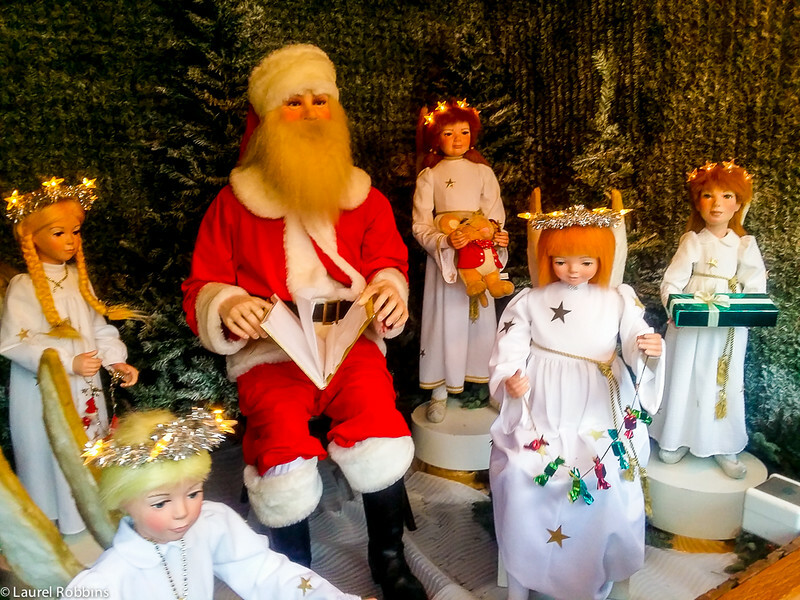 The fairytale village features singing Santa Clauses and angels are a hit with kids. It’s also a hip place to hang out with live music. The commonality that ties it all together is the environmental focus. I plan multiple trips to Tollwood each year. It’s fun meeting friends and listening to free live music at the Tief im Wald Bar (Deep in Forest Bar), the coolest bar I’ve ever been to complete with a forest atmosphere. or to listen to one of the incredible presentations. A couple of years ago I saw a film about my idol, Jane Goodall film (famous primatologist who works with chimpanzees). This year I’ll honour of hearing her speak at Tollwood. I also enjoy attending the incredible presentations. A couple of years ago I saw a film about my idol, Jane Goodall film (famous primatologist who works with chimpanzees). This year I’ll honour of hearing her speak at Tollwood. A couple of years ago I saw a film about my idol, Jane Goodall film (famous primatologist who works with chimpanzees). In 2016 I had the honour of hearing her speak at Tollwood. I’ve spent more money at Tollwood than I have at all the other Christmas Markets I’ve visited combined. While I’m not much of a shopper, my favourite Christmas market find was at Tollwood. It’s a handcrafted coffee table built from a Bavarian farmhouse dating back to 1807. Tollwood is often described as a “small Oktoberfest” since the winter festival is held on the same ground as Oktoberfest. I’ve never seen anything as eclectic, making it a strong contender for my favourite festivals of all time. Only the World Nomad Games are in contention! Not only is it the largest and oldest in Munich, it’s also one of the oldest in the world! 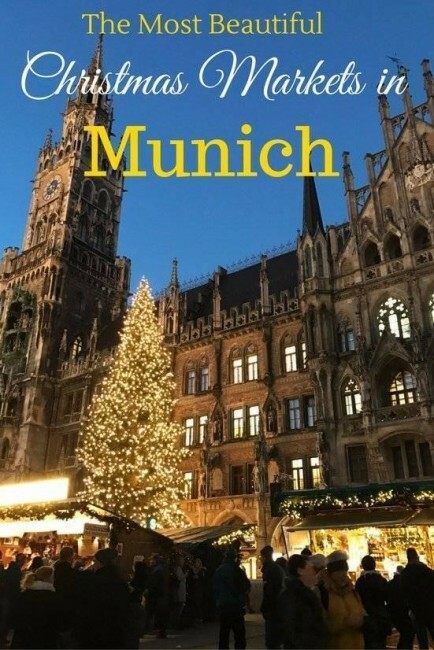 According to the official Munich Christmas Market site, it was first mentioned in the town records in 1642, but according to Wikipedia, it’s the second oldest in the world, dating back to 1310. Only the Vienna Christmas market is older (1294). Regardless of its exact age, it retains its original essence with 150 wooden huts selling Glühwein (mulled wine), traditional sweets, Christmas ornaments and toys. OK, now it’s time for a confession. While I believe it is by far the most beautiful Christmas market in Munich, it’s also not my favourite. Don’t get me wrong, I still go several times a year, but it’s busy. I mean crazy busy, especially in the evenings when its lit up and at its finest. It’s also by far the most popular Christmas market in Munich with tourists. And I don’t do crowds. I prefer the smaller, albeit less impressive Christmas markets that attract less people. It’s just steps away from the more popular Marienplatz, but feels worlds away and the stars hanging from the trees give it a whimsical feel. Christmas pyramids are usually much smaller and used for decorative purposes inside, but I love this oversized one that serves as a Glühwein stand at the Sternenplatzl. It’s thought that Christmas pyramids were the predecessor to the Christmas tree, so perhaps the medieval Christmas markets had more of them! Traditional Christmas pyramid at Sternenplatzl (Star Platz) at the Rindermarket in Munich. The Munich Christmas Market runs the length of Kaufinger Strasse, a pedestrian shopping street. A Glühwein stand that is a replica of the Frauenkirche (church). The Frauenkirche Glühwein stand at the Christmas market isn’t nearly as impressive during the day. What is “probably” the largest Manger Market can be found at the Munich Christmas Market. I’m not in the market for a new manger, but even I can appreciate the craftsmanship of some of the wood carvings. 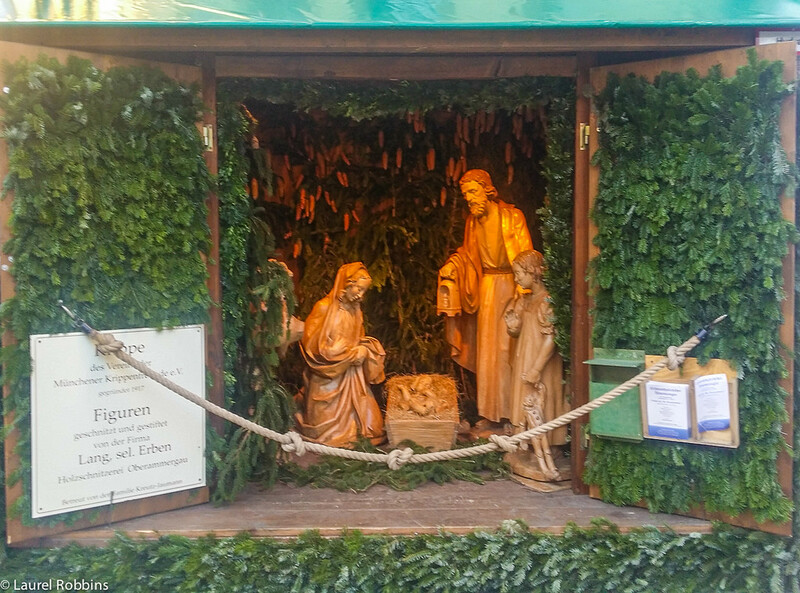 Life-size hand-carved manger scene from a craftsman in Oberammergau, a region in Bavaria. 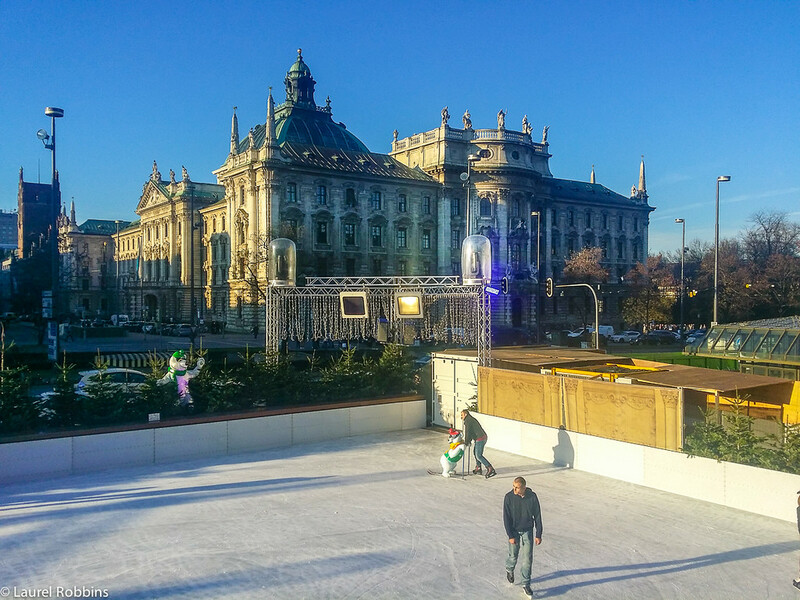 There’s even a skating rink at Stachus (Karlsplatz). This is well thought out as there’s a Glühwein bar overlooking the skating rink – a win-win for both parents and kids…or kids at heart! 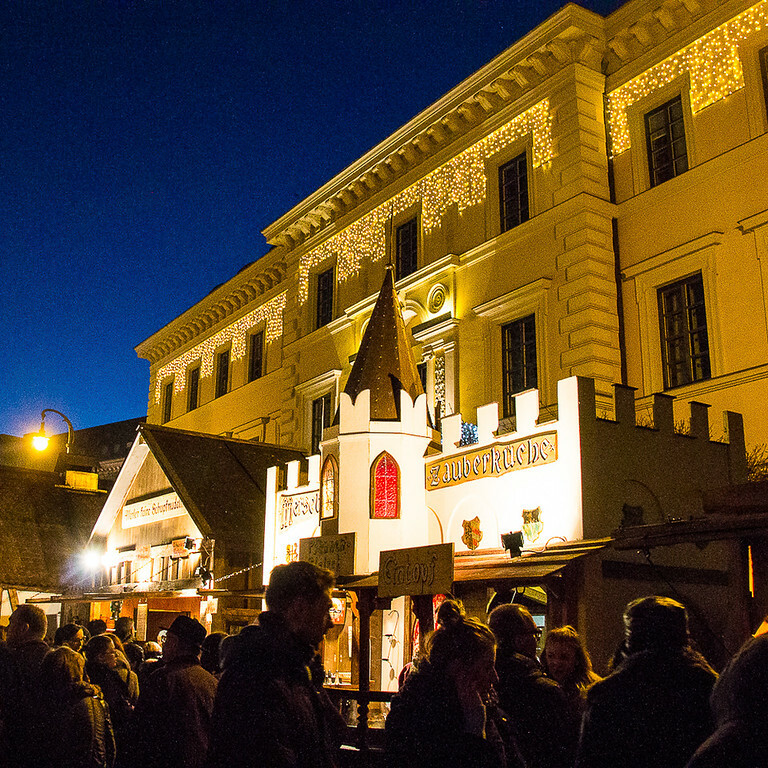 If you go to a Christmas market and only try one thing, let it be Kaiserscharrm. Named after the Austrian Emporer (Kaiser) Franz Joseph I of Austria, it has royal roots. It’s a fluffy cut up pancake that is sprinkled with icing sugar and usually served with a side of applesauce. My German and foreign friends alike both go nuts for it. Being Celiac (gluten-allergy) I have to skip it, but you can try it at the Munich Christmas Market on Kaufinger Strasse. Kaiserschmarrn is a must-try at the Munich Christmas Market. This market is charming with hanging lanterns scattered throughout. But what really impressed me about it was the artisans. It has some of the most talented artisans I’ve seen at any Christmas market. There’s also an Art Tent where vendors display their larger works of arts. This bohemian type market will be especially appreciated by anyone with an interest in art, or those looking for a unique gift. This 5-star design hotel gets raves reviews for its location – it overlooks the Old Botanical Garden. Guests love its special touches, like the original paintings by Munich artist Franz von Lenbach in every guestroom. This 4-star hotel is in the heart of Munich. It features old-world charm, a 16th-century restaurant and floor to ceiling windows. A classically furnished 4-star hotel, with some rooms offering views of Isator (one of the city’s three remaining gates). Located in Bogenhausen, where some of Munich’s most extravagant villas, can be found, this 4-star hotel overlooks the English Garden. You’re just a few minutes’ walk away from the Christmas Market at the Chinese Tower. Afterwards, you can warm up in the hotel’s Finnish sauna! Getting There: Oberföhringerstraße 191, Bogenhausen, 81925 Munich (~12-minute tram ride to the city centre). Note: This article was originally published in 2011, but was updated in December 2017. I had no idea a city could have that many markets! I always think of one Christmas market per city, like in France. I'm now thinking Germany would be wonderful to visit over Christmas next year. That is a lot of markets! Good luck with the Chimpanzee photo! Isn't it interesting to see how different Chrismas markets can be? I too prefer the more original ones, the ones that doesn't try to appeal to foeign tourists too much. I been wanting to go to Christmas Market in Germany for all my life =DD Thank you for posting this, I think I will like the Medieval market (double themed is even better than only Christmas!) and Schwabing market. Which market has the best food to you? I'm jealous too! It's not very Christmas-y here in Thailand. Which may be a good thing this year. I am dreading the first Christmas without my Dad. :-( I am so desperate for a while Christmas and lots of Gluhwein, though. Maybe next year! I have become increasingly obsessed of late with visiting Christmas markets in Europe - here's three more added to my growing list! The Medieval Christmas Market looks like it would be my favourite. @Zhu - I was surprised too. Some of them are small, but still 24 is a lot for one city. @Claire - I love Germany in December, it's a beautiful time to come. Thanks for the wishes on the chimpanzee photo. Fingers crossed. @Julia - I'm a lucky girl :) Glad that you're able to find Gluehwein in Turkey. I've had more than my fair share already but don't plan to slow down. @Michael - Agreed, some of them are really different and after seeing so many, they need something unique to make them stand out. @Annie - The medieval market in Munich is fun, but the one in Esslingen is even better. Regarding food, I would have to say Tollwood since they have all the traditional German food, but also an international food court with Thai and Indian food to name a few. The best Gluehwein I've had is at the Munich Residenz Christmas Market which I also really enjoy, but wasn't one of my top 3. @Barbara - I really missed Christmas when I lived in Thailand as well. The second year I lived there we decided to go for a beach holiday - one of the most un-Christmasy things you can do. The first Christmas after the loss of a loved one is the toughest - my thoughts are with you. @Lisa - Me too. I've already started on my list for NEXT year :) @Sam - The medieval one is a lot of fun. I stopped by the Schwabing market last year (2010) on my way to see some friends around the Münchner Freiheit area - the market was a lot of fun, and had a different and distinct vibe than the markets in the Mitte. I've heard some great things about Tollwood at various times of the year. In all of the times I've visited Munich over the last ten years, I've never been to Tollwood. Usually my schedule is a little tight and there's enough to pack in just a single visit with friends and, perhaps, a museum or two, over a period of two to three days. Perhaps, I can fix that by visiting Tollwood at the end of next year ... Thanks for your post, Laurel! Love the first one! Was the stuff expensive? Now a family tradition for us - we visit Germany every year the last weekend before Christmas. We've been to Munich 3 times, but Cologne is our favourite. We've been to Berlin (which was incredibly crowded and a bit unpleasant for that reason) and did a quick visit to Bonn last year where the market is small but you could visit Beethoven's house. This year we are trying Dusseldorf. Stephen. @Stephen - You sound like the Christmas market expert! I haven't been to the Christmas markets in Cologne or Berlin yet. The one in Bonn also sounds lovely. Let me know how the one in Dusseldorf is. I'll be exploring more Christmas markets in southern Germany/Austria this year. One of the few things I am excited for, being here this time of year. I hate the weather, but these markets are going to be so much fun to shoot. @Michael - You will love it. There's no shortage of Christmas markets in Germany. I'm doing my first Christmas market photo shoot of the year later this week. Andy and I were just in Frankfurt over the weekend for their Christmas Markets and they were pretty great! Maybe we'll get to Munich to check these out next year. Christmas Markets make cold December slightly more bearable. If only they lasted through the whole winter! @Ali - I haven't been to the Christmas Markets next year, maybe that will be on my list. We can swap places. Agree, it's impossible to see them all in less than a month. @Nisha - I was surprised as well. Hope you enjoy your visits. Let me know if you find any that you really like, I'm always on the lookout for new ones to explore. I have been reading a lot about Germany Christmas markets.... sounds really good! It looks like perfect Christmas spirit is in the air. @Renuka - I love the Christmas markets, it really does get you in the holiday spirit. Hope you guys had a wonderful holiday ... cheers! How could I ever choose! These all sound like great Christmas markets. What a nice Christmas in Munich ! Love Christmas in Munich, very festive! Christmas Village seems to be great place with awesome food to taste however 25 markets in one city is really a surprise for me. I believe each market has something different to offer for Christmas. How late are most of the Christmas Markets open until? Hi Lori Most close Dec 23rd or 24th, and are open till ~ 9:00 pm, but some will close at 8:00pm. @Lori, The one at Marienplatz is the largest, but the one at Münchener Freiheit is the best for buying handmade goods (jewellery, pottery, candles, etc.) made my artisans. Good reason to keep coming back I want to leave a comment in your support. Carry on with good continuation. Best of luck for your blogging efforts. Such a nice Medieval Christmas Market! This look awesome post and picture also. Thank you so much for sharing it. @laurel Thanks for this write-up and the focus on sustainability. I think it's a place where a lot of companies could do more and I appreciate your willingness to include it as part of your approach to travel! Thank you Laurel for refreshing my memories. Last year my I went to Munich with my family. 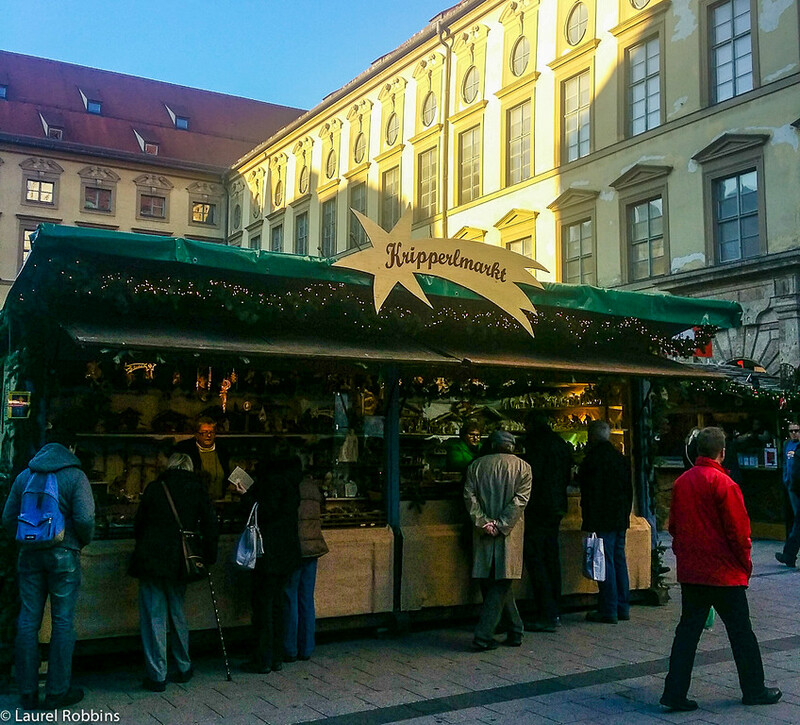 The Christmas market in Munich tempts us to stay and look around. These markets have everything that belongs to a Christmas crip.